Starting with the fall of Saigon in April 1975, refugees from Vietnam awaited approval to move to the US and other countries. By 1979, there were almost 62,000 Vietnamese in refugee camps, with more than 140,000 people displaced from Cambodia and Laos. Portland, Oregon, was one of the medium-sized US cities that dealt with the relatively sudden influx of every major ethnic group (Vietnamese, Lao, Hmong, Mien and Cambodian) from Southeast Asia. Fifteen former refugees were interviewed for the Refugee Dreams Revisited project, which was created for the Peabody award-winning series Crossing East that ran on 230 public radio stations. Since 1991, I’ve run MediaRites, a 501(c) 3 nonprofit production organization based in Portland, Oregon, dedicated to telling the stories of diverse cultures and giving voice to the unheard through the arts, education and media projects. 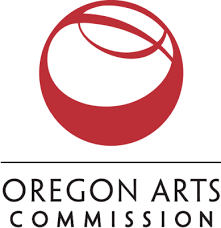 Currently, the Oregon Cultural Trust is doubling donations given to MediaRites until December 31, 2016. 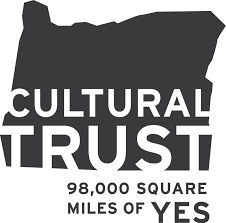 Make a donation to MediaRites, and donate the same amount to the Oregon Cultural Trust, and you get that same amount back as a tax credit. 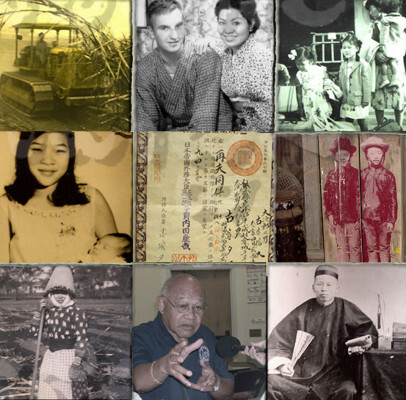 We’re in the final stages of completing the Crossing East Online Archive Project of more than 200 hours of oral history interviews of Asian American/Pacific Islander stories. We need your help to raise $3000 to complete our budget so we can preserve important historical stories. In digitizing the recordings we collected for the original Crossing East history series 10 years ago, we’ve learned so many of the elders, activists and scholars we interviewed are no longer with us. Since Crossing East aired 10 years ago, we’ve lost historians Ronald Takaki, Wayne Maeda and Jeffrey Barlow as well as civil rights leader Yuri Kochiyama and labor activist Ah Quon McElrath. Ed Wah, one of the last relatives of Oregon’s Ing “Doc” Hay and Carolyn Micnheimer, the former caretaker of the Kam Wah Chung museum in Eastern Oregon are also gone. And so many elders we interviewed across the country have left us too. Their stories can live on in the Crossing East Archive. New stories about AAPIs and African Americans to trace historic tensions and moments of unity for our “Relations” one-hour radio documentary which will also air in May on public radio stations. Now more than ever we need to learn how to work together. And Refugee Dreams Revisited, the Portland Southeast Asian refugee segment for the Crossing East series. We’re working with AAPI youth for a series of free staged readings directed by professional directors Samson Syharath and Lidet Vivarong. Each public performance will be accompanied with a post-show panel discussion with original interviewees such as Kilong Ung, Lee Po Cha and Sokhaum Touch to name a few of the community leader elders. Help us with our goal to raise $3000 by the end of the year so we can complete our budget for the Crossing East Archive Project. 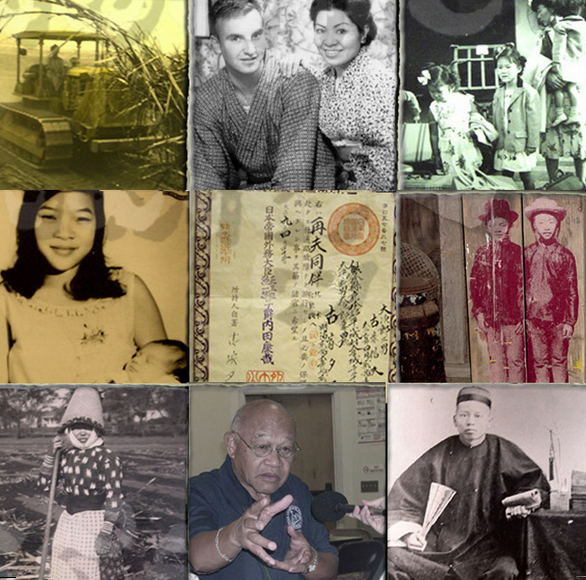 Please consider an end of the year donation to help us archive all the valuable broadcast-quality recordings, perhaps the most complete collection of AAPI history interviews from around the country and to produce the new “Relations” radio documentary as well as to help youth to perform the stories of Portland’s Southeast Asian refugees elders. To make a tax-deductible donation, click the PayPal link on the home page of our site: mediarites.org. Or reply to this email for a mailing address. Donations of $50 or more will receive a season subscription for our Theatre Diaspora project plays in 2017 or a digital download of the entire Crossing East radio series or anything in our store! Wishing you a warm holiday season and thank you for your support! MediaRites provides innovative, award-winning radio, theater and documentary programs. For more information, visit the MediaRites website: www.mediarites.org. our Crossing East Archive Project! 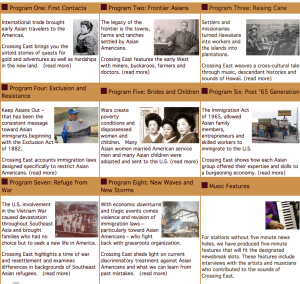 More than 10 years ago, MediaRites debuted Crossing East, (Our Stories, Our History, Our America), the first and to date only Asian American/Pacific Islander history series on public radio. In 2016 we embarked on an exciting project to save more than 150 hours of oral history recordings gathered for this groundbreaking Peabody Award-winning radio series hosted by George Takei and Margaret Cho. We digitized all the interviews, transcripts and photos online for the public to use for educational purposes. This act of preservation is called the Crossing East Archive Project. 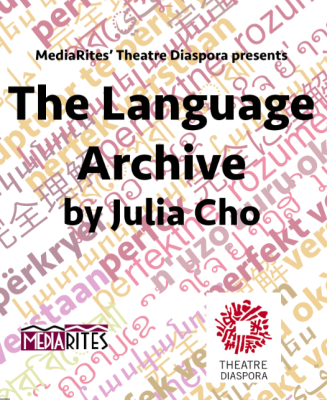 MediaRites’ Theatre Diaspora presents The Language Archive, a poignant comedy about dying languages and difficulties of love by award-winning playwright and television writer Julia Cho. 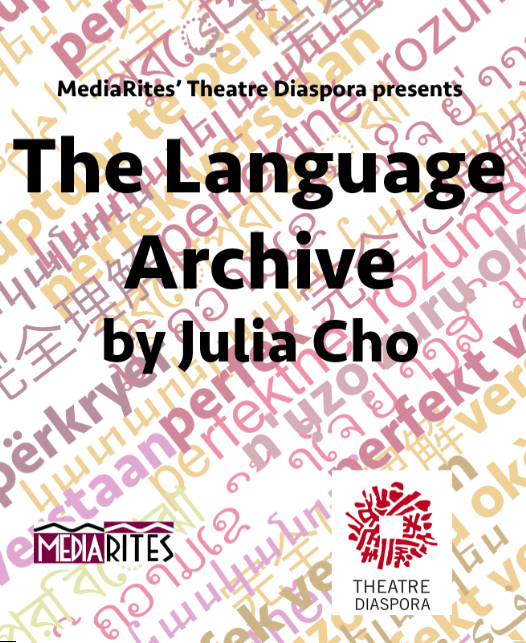 In The Language Archive, a language archivist is consumed by the preserving and documenting the dying languages from far-flung countries. Closer to home, however, he can’t communicate with his frustrated wife, nor deal with the deep feelings his lab assistant has for him. The performance will open at 2pm on March 26th at Portland Center Stage (128 NW Eleventh Avenue, Portland, OR 97209) and will close at 2pm on April 2nd at the Milagro Theatre (525 SE Stark Street, Portland, OR 97214). Tickets are $8 each. They can be purchased at pcs.org for the 2pm March 26th show at Portland Center Stage, and at http://www.brownpapertickets.com/event/2510978 (service charge added) for the 2pm April 2nd show at the Milagro Theatre. 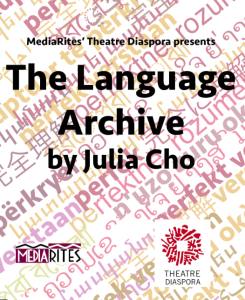 Julia Cho is an American playwright and television writer who has won national awards for her work. She was born in Los Angeles, California, and is the daughter of Korean immigrants. Her plays include The Language Archive, The Piano Teacher, Durango, The Winchester House, BFE, The Architecture of Loss, and 99 Histories. She has been a resident playwright at New Dramatists since 2004. Her work has been produced at the Vineyard Theatre, The Public, South Coast Repertory, Long Wharf Theatre, Playwrights Horizons, New York Theatre Workshop, East West Players, Theatre @ Boston Court, and Silk Road Theatre Project, among others. 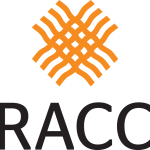 Honors include the Susan Smith Blackburn Prize, Barrie Stavis Award, the Claire Tow Award for Emerging Artists, and the L. Arnold Weissberger Award. Durango was also named one of the Top 10 Plays of 2006 by Entertainment Weekly and one of the Best of 2007 by the The L.A. Times. She is an alumna of the Juilliard School and NYU’s Graduate Dramatic Writing Program.